Ireland’s Johnny Sexton celebrates with the Triple Crown trophy and team mates during the presentation at the end of the match. 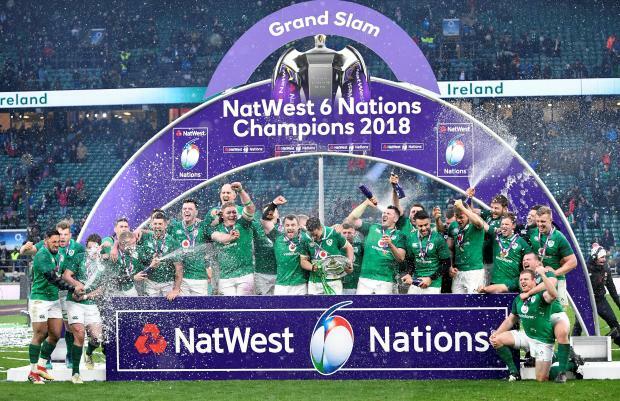 Ireland secured their third Six Nations grand slam in emphatic style on Saturday when, on a St Patrick's Day to remember, they overwhelmed defending champions England 24-15 to join the men of 1948 and 2009 in the country's rugby hall of fame. Ireland's Conor Murray added a penalty in their only second-half score before England finished with a Jonny May try in stoppage time that came far too late to spoil what will be an Irish party to remember. Following Scotland's win in Rome earlier on Saturday and with just the Wales versus France game left in the championship, England will finish outside the top three for the first time in 12 years and could end as low as fifth. Ireland, who have now won 12 games in a row, top the standings on 26 points ahead of Scotland on 13, Wales 11, France and England on 10 and Italy with one.